In this visionary memoir, based on a groundbreaking New York Times Magazine story, award-winning journalist Katy Butler ponders her parents’ desires for “Good Deaths” and the forces within medicine that stood in the way. Katy Butler was living thousands of miles from her vigorous and self-reliant parents when the call came: a crippling stroke had left her proud seventy-nine-year-old father unable to fasten a belt or complete a sentence. Tragedy at first drew the family closer: her mother devoted herself to caregiving, and Butler joined the twenty-four million Americans helping shepherd parents through their final declines. When doctors refused to disable the pacemaker, condemning her father to a prolonged and agonizing death, Butler set out to understand why. Her quest had barely begun when her mother took another path. Faced with her own grave illness, she rebelled against her doctors, refused open-heart surgery, and met death head-on. With a reporter’s skill and a daughter’s love, Butler explores what happens when our terror of death collides with the technological imperatives of medicine. Her provocative thesis is that modern medicine, in its pursuit of maximum longevity, often creates more suffering than it prevents. This revolutionary blend of memoir and investigative reporting lays bare the tangled web of technology, medicine, and commerce that dying has become. And it chronicles the rise of Slow Medicine, a new movement trying to reclaim the “Good Deaths” our ancestors prized. Knocking on Heaven’s Door is a map through the labyrinth of a broken medical system. It will inspire the difficult conversations we need to have with loved ones as it illuminates the path to a better way of death. “This is some of the most important material I have read in years, and so beautifully written. It is riveting, and even with parents long gone, I found it very hard to put down. Katy Butler's book will challenge and nourish you. I am deeply grateful for its truth, wisdom, and gorgeous stories—some heartbreaking, some life-giving, some both at the same time. Butler is an amazing and generous writer. This book will change you, and, I hope, our society." "A forthright memoir on illness and investigation of how to improve end-of-life scenarios. With candidness and reverence, Butler examines one of the most challenging questions a child may face: how to let a parent die with dignity and integrity. Honest and compassionate thoughts on helping the elderly through the process of dying." "This is the most important book you and I can read. It is not just about dying, it is about life, our political and medical system, and how to face and address the profound ethical and personal issues that we encounter as we care for those facing dying and death. You will not be able to put this book down. Its tenderness, beauty, and heart-breaking honesty matches the stunning data on dying in the West. A splendid and compassionate endeavor." "This beautifully written and well researched book will take you deep into the unexplored heart of aging and medical care in America today. With courage, unrelenting honesty, and deepest compassion, Katy Butler shares her saga of how a family of independent, thoughtful, and complex souls attempt to navigate their uncharted journey through medical institutions and specialties. Here, the degree of individual and family suffering turns on myriad decisions, large and small, coerced by economic and institutional forces. Knocking on Heaven’s Door makes it clear that until care of the soul, families, and communities become central to our medical approaches, true quality of care for elders will not be achieved." 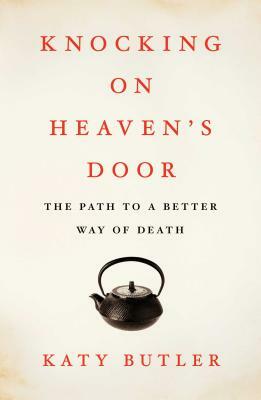 "Knocking on Heaven's Door is more than just a guide to dying, or a personal story of a difficult death: It is a lyrical meditation on death written with extraordinary beauty and sensitivity. "A stunning book, truthful and its dignified, and it could be a conversation-starter. If there's a need for that in your family - or if you only want to know what could await you - then read Knocking on Heaven's Door. You won't regret it."